It’s Christmas!!! And obviously, you are going to have a Christmas tree in your home, if I am not wrong. People immensely enjoy this time of the year and Christmas tree is an important part of it. The craze is such that people start working on their Christmas trees just after the ‘Thanksgiving’ which is actually the perfect time. I don’t know when do you start setting up your Christmas tree. Well, you can be a bit relaxed if you are planning to get an artificial Christmas tree, which is rocking these days. Umm…lets get to the point, whenever you do it, you must be breaking your head to get some amazing Christmas tree decorations in order to make the most beautiful tree ever. 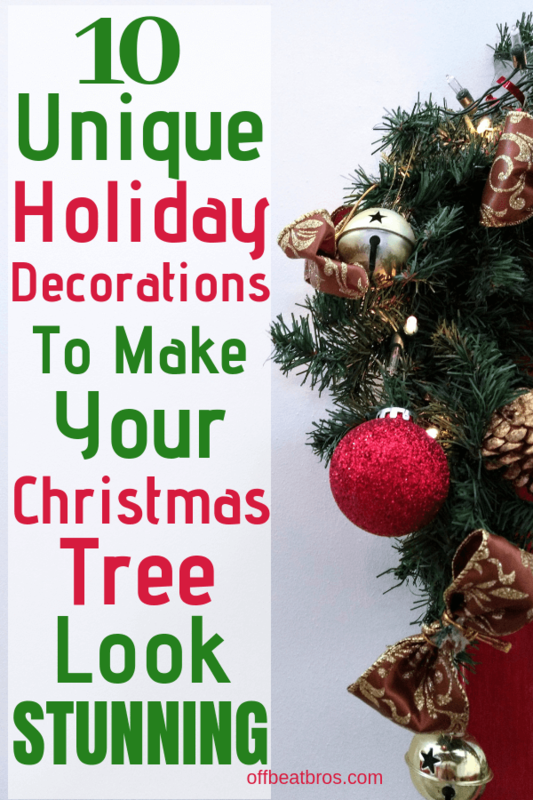 And for that, you need to switch from the regular, same old decoration of red and green balls, boxes and other ornaments. Don’t worry you don’t have to break your head in thinking of new ideas. I have them ready for you. So have a look at the following Christmas tree decorations that will altogether your Christmas tree fabulous and different. These decorations will simply bring a charming vibe to your Christmas tree. The floral pattern and the star-shaped patchwork looks so perfectly designed. Instead of giving the entire piece a ruffled effect, only the borders are made such which makes them completely different from the inner portion along with highlighting them. The star-shaped patchwork matches with the Christmas tree topper which itself is normally a star. Its color and the pattern gives it a royal look. This color matches the other most used colors for the tree. You can easily get one from Amazon here. Toss out the traditional style string lights and opt for these. Just imagine a tree with these globe lights and the traditional style mini bulb lights. I don’t need to say anything else. Get them home-delivered from Amazon. This one is for the winter theme, silvery look for the snowfall. Now, they look like something fragile. But don’t worry, they won’t break as they are made of plastic. These pine cones are storage friendly, so can be used again the following year or some following event. Buy them here. Ya, this is the ball ornament, but it is very different from the common red and green balls, as seen in the picture. It has the finishing of marble making it completely different and giving it a premium look. But yes, the actual material is plastic though it doesn’t look like it unless touched. Obviously, you can’t expect balls of marble for decorating a tree. Add this Angel to the top of your fir. Perfect! Shop it from Amazon today. These will definitely look much better than the red and green ball ornaments. Made of wood, they are of a rustic look, which makes your Christmas tree simple but elegant. I will definitely prefer getting these rich looking decoration rather than those shining ball ornaments. Each one of it has something written on it, you can even decorate your mantel with this vintage style ornament. Want them? Easy, get them here. It is a must-have for you if you have bought an artificial Christmas tree. The balsam fir mixed with juniper berries, fresh pine, and warm cedarwood will make your tree smell heavenly. The smell will fill up your entire house and can easily last for 12-15 days. Well, the lasting actually depends on the size of your house, so can’t say much. But, these will definitely bring life to your Christmas tree and add that missing Christmassy vibe you get from a real tree. This thing glittered looks really good and when you will decorate your fir tree using this, I have no words to describe how will it look. Just imagine! A good substitute for the boxes and balls. The glitter powder will fall off, but that’s in its nature. Add these berry picks to your tree. Do you think this decor is unconventional? Well, a thought about this may pass your mind, but these red picks will look great on the very green Christmas tree. Trees decorated with candles reminds me of the olden times. LED candles have been used here to avoid fire. These are wireless candles controlled with a remote, so you can clip them anywhere. Not just Christmas, these can be used at any time of the year. If you like these ideas, do share the post!